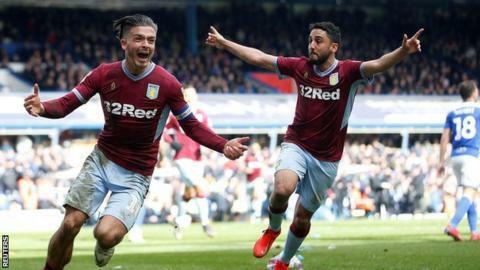 Jack Grealish's 67th-minute winner settled an ugly derby, but Aston Villa's second victory over Birmingham City this season will be remembered not for the goal but for an attack on the visiting skipper by a spectator from the home section. City say they will ban for life the man, who was immediately apprehended following the 10th-minute incident in which he ran on to the pitch at the home Tilton End and punched Grealish from behind. Although Grealish recovered to score Villa's winner, the rest of a heated contest was played out under a cloud. Villa could have won by more if, shortly after their goal, Conor Hourihane had not hit the bar from Grealish's pass. But Blues then wasted two glorious late chances when Villa old boy Craig Gardner, on as a substitute, blazed over the bar from close range before bulleting a header just past the post. As it was, Villa climb above Blues to ninth in the Championship table, back within four points of the play-off places. The incident which sparked the ill feeling in the crowd prior to the attack on Grealish was home midfielder Maikel Kieftenbeld's late challenge on the Villa captain, in only the fourth minute. He was booked, just as he had been for his earlier foul on Grealish in Blues' 4-2 defeat at Villa Park in November. But it was clearly not received well by the Blues fans, who noisily suggested that Grealish had been over-theatrical in the way he fell to the ground. And six minutes later, when Grealish was up in support of a Villa charge at the Tilton End, he was attacked from behind by a spectator, who had somehow evaded the line of orange and yellow-jacketed stewards to make his way on to the pitch. After Grealish had been picked up off the floor and given the go-ahead to continue, the game took a while to reignite. But both sides had chances before the break. Home keeper Lee Camp saved with his legs from Anwar El Ghazi before Villa top scorer Tammy Abraham ballooned an effort over at the near post, while claiming he had been hampered. At the other end, Blues' top scorer Che Adams saw a shot from 25-yards fly just wide. The second half proved just as competitive and as unlikely to yield a winner, until Villa's double substitution when they introduced Andre Green and John McGinn. First Green was denied a goal from his initial touch when he got his head to Grealish's cutback from the byeline, only to be blocked by Wes Harding. Then Grealish himself took centre stage, latching onto McGinn's crossfield ball before weaving his way into the box to thread his low shot inside Camp's left upright. Grealish was booked for jumping over the barrier into the crowd to celebrate, receiving one of the game's six cautions from referee Tim Robinson. Shouts for a penalty were waved away by the referee at the home end when Adams went down, and Gardner should have done better with both his chances. But Villa had the cutting edge when it mattered most. "Jack Grealish is a mature lad, and he responded well. There was only one way to answer that and that was to pop up with a winner like he did. "I'm really proud of the way he handled it. He only came off as he was knackered, cramping up. "It was a scrappy derby in difficult conditions but we were the better team in the second half and deserved to win. "A lot has been made of the Birmingham City team spirit, but we showed a lot of spirit ourselves. Conditions were tough but we put in a gritty performance." "We feel gutted. It's a painful one for us. We now have to pick ourselves up for the game here on Wednesday (at home to Millwall). "It was played in difficult conditions, but we did enough to warrant at least a point. We just gave them too much space for their goal. "We had our chances but the ball just didn't want to go in. "And, as for the challenge on Che Adams in the box, if that had happened anywhere else on the pitch, it would have been a foul." Match ends, Birmingham City 0, Aston Villa 1. Second Half ends, Birmingham City 0, Aston Villa 1. Corner, Birmingham City. Conceded by Tyrone Mings. Attempt missed. Craig Gardner (Birmingham City) header from the centre of the box is close, but misses to the left. Assisted by Connor Mahoney with a cross following a corner. Corner, Birmingham City. Conceded by Ahmed El Mohamady. Foul by Birkir Bjarnason (Aston Villa). Craig Gardner (Birmingham City) wins a free kick in the defensive half. Attempt missed. Craig Gardner (Birmingham City) left footed shot from the centre of the box is too high. Corner, Aston Villa. Conceded by Wes Harding. Birkir Bjarnason (Aston Villa) wins a free kick on the left wing. Substitution, Aston Villa. Birkir Bjarnason replaces Jack Grealish because of an injury. Delay in match Jack Grealish (Aston Villa) because of an injury. Foul by Jack Grealish (Aston Villa). Substitution, Birmingham City. Craig Gardner replaces David Davis. Conor Hourihane (Aston Villa) hits the bar with a left footed shot from outside the box. Assisted by Jack Grealish. Attempt blocked. Conor Hourihane (Aston Villa) left footed shot from outside the box is blocked. Assisted by John McGinn. Attempt saved. Lukas Jutkiewicz (Birmingham City) left footed shot from outside the box is saved in the bottom right corner. Assisted by Wes Harding. Neil Taylor (Aston Villa) wins a free kick in the defensive half. Ahmed El Mohamady (Aston Villa) wins a free kick in the defensive half. Jack Grealish (Aston Villa) is shown the yellow card for excessive celebration. Goal! Birmingham City 0, Aston Villa 1. Jack Grealish (Aston Villa) left footed shot from the left side of the box to the bottom right corner. Assisted by Neil Taylor. Delay in match Tammy Abraham (Aston Villa) because of an injury. Attempt missed. Tammy Abraham (Aston Villa) right footed shot from the right side of the six yard box is close, but misses to the right. Assisted by John McGinn. Attempt missed. John McGinn (Aston Villa) header from the centre of the box misses to the right. Assisted by Anwar El Ghazi with a cross. Attempt blocked. Andre Green (Aston Villa) header from the centre of the box is blocked. Assisted by Jack Grealish. Substitution, Aston Villa. Andre Green replaces Albert Adomah. Substitution, Aston Villa. John McGinn replaces Glenn Whelan.